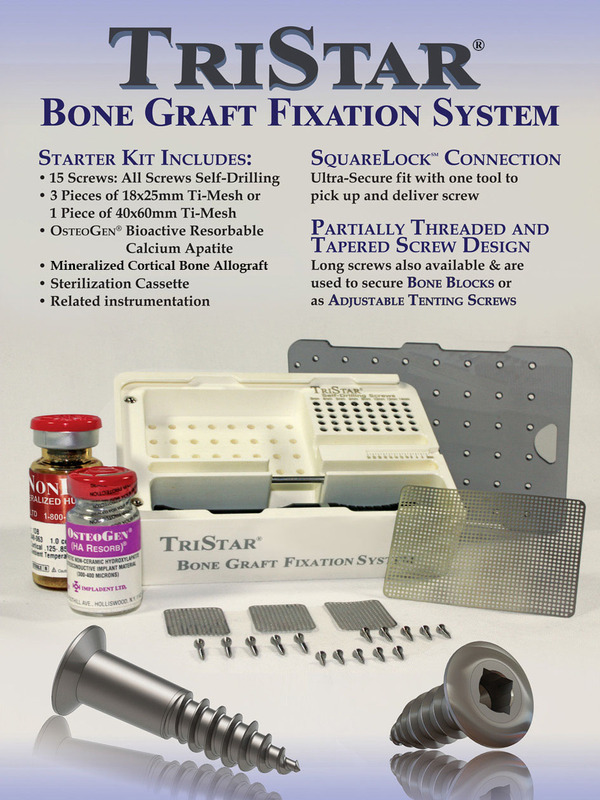 The TriStar Bone Graft Fixation System consists of titanium alloy self-drilling screws which are tapered and have a maximum diameter of 1.75mm with lengths of 3mm, 4mm, 5mm, 6mm, 8mm, 10mm, 12mm, 14mm, 15mm, 18mm, 21mm, and 24mm. The screws are manufactured using a Ti-6Al-4V alloy (ASTM F-136) and adhere to standards tested under ASTM F-543. This system also includes a number of accessories used to fixate the screws and/or membranes or bone blocks to the host bone including a square headed morse tapered hand screw driver, screw driver handle, and latch type driver. The system includes titanium mesh in 40mm x 60mm or 18mm x 25mm sizes each having a thickness of 0.1mm. The screws and titanium mesh are designed to be removed from the patient after such time when sufficient bone regeneration is demonstrated. The devices are sold non-sterile. Single use only. Each screw in the TriStar® Bone Graft Fixation System is self-drilling and does not require the clinician to pre-drill a hole in the host. Each screw also features the Impladent Ltd. tapered SquareLock Connection which provides and ultra secure fit that allows the user to pick up and deliver the screw using only one tool, reduces driver slippage and provides excellent driving torque upon delivery. All short screws (3mm, 4mm and 5mm) are designed to secure titanium mesh and membranes. There is no need to use an additional tool or a mallet to deliver. All medium length screws (6mm, 8mm, 10mm, 12mm and 14mm) are partially threaded and tapered. These screws are designed to secure bone blocks and as adjustable tenting screws. For bone blocks, the partially unthreaded portion functions as a lag screw and provides intimate contact of the bone to the host. Use a 2.0mm drill to drill through the bone block. Blocks secured by fully threaded screws cannot achieve this level of host adaptability without the thread binding to the block and pulling away from the host. The tapered design on the medium length screws also functions as an Adjustable Tenting Screw allowing the clinician to adjust the height/direction from 1-2mm when used in tenting procedures. Competitor tenting screws have a flat shelf in-between the threaded and unthreaded portions which locks in the height of the tenting portion of the screw. Our tapered design allows the clinician to adjust the height of the “tent-pole” to suit the clinical application. Additional longer fully threaded screws are available in lengths of 15mm, 18mm, 21mm and 24mm for Vertical Vascular Osteotomy Procedures.